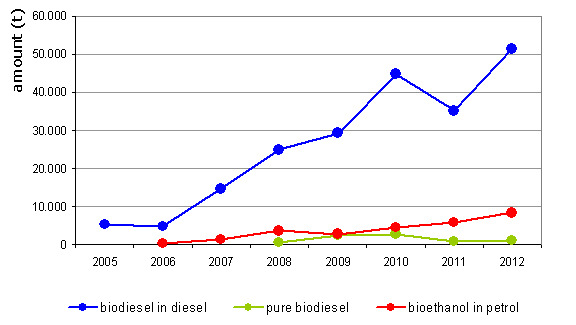 The introduction of biofuels in Slovenia and the objectives in this area are lagging behind the referential values of the EU Directive on the promotion of the use of biofuels and other renewable fuels for transport, which amount to 2 % by the end of 2005, 5.75 % by the end of 2010 and 7.5% by 2015. Slovenia explains the deviations from the referential values by the limited possibilities of biofuel production, the discrepancies between the prices of mineral fuels and biofuels, and thus the non-stimulating market conditions that do not promote consumer to use biofuels. Report of the Government of the RS, 2005-2012. Measures to promote the use of biofuels, the total stock of fuel for transport and the share of biofuels, the Ministry of Agriculture and the Environment. 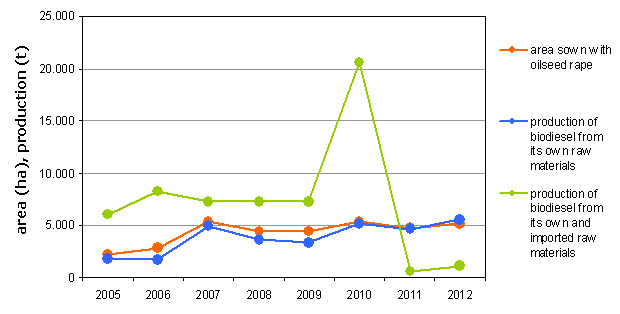 Reportof the Government of the RS, 2005-2012. Measures to promote the use of biofuels, the total stock of fuel for transport and the share of biofuels, the Ministry of Agriculture and the Environment. at least 7,5 % in 2015.